As a working mum myself, I find the juggle of getting meals on the table can be quite tricky some weeks. 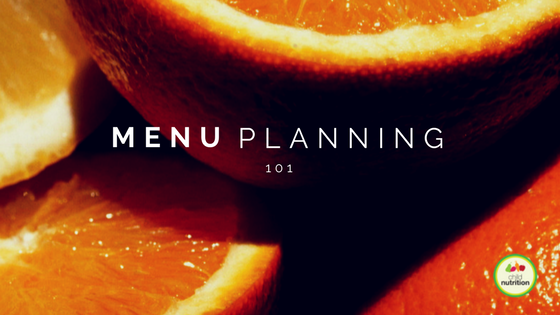 As a result of the stress involved in trying to get nutritious meals on the table, I decided to embrace Meal Planning to try to simplify things for myself and give me more time to actually spend with my children at the end of the day. As mentioned in the “What you need” section, the first thing you need to do is to sit down and make a few lists. Now that you have all of your lists, you’re ready to go. When starting to fill in my meal planning page, I tend to start with the days where there are other activities on as usually these days will require a meal that is quick and easy to prepare (or even better can be pre-prepared) such as bolognaise pasta or sushi. 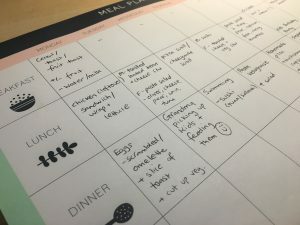 Once I have filled in all of the busy days, I look at which days are left and try to make sure that I am making different sort of foods from day to day. For example, I will try not to do two pasta nights one after another, or too many chicken nights in a row. Consider what could be a good option for lunchboxes the next day too. Something like roast chicken makes a great sandwich filler/salad accompaniment for a few days following, or stir fries with rice are great warmed up the next day at work. 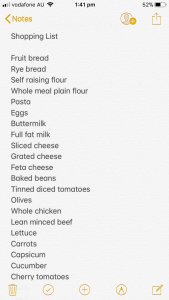 When all of the main components of the meals have been filled in, I then think about which vegetables I might be able to put with each meal, again trying to mix it up from day to day. Even in my household, the variation of vegetables can be quite limited, but I still try to make sure that they are different from day to day, or at least different to what appeared in the lunchbox that day at school. You have your lists and your plan, now what? Now it’s time to make a shopping list. Look at everything you have put on your meal plan for the next 3-4 days and make sure that you purchase all of the fresh ingredients so that they are on hand for the days when you need them. When I go to the butcher, I try to buy 2 weeks worth of meat at a time to save me from making this trip multiple times (and at the moment, my freezer is big enough to accommodate this). For fresh ingredients, I either set up a supermarket delivery of the staples that usually require replacing (milk, bread, fruit, and all other items require for me to make the second half of my week’s meals), or I try to get to the supermarket one afternoon after work, or in the evening if I can. I always try to make batches of everything that can be done in a batch. The obvious batches are bolognaise sauce (which can be turned into shepherd’s pies, lasagnes, or used for its original purpose as a pasta sauce). You can also freeze cooked pasta in zip lock bags which will save you at least 20 minutes each night you don’t have to cook it from scratch. You can make batches of soups, burger patties/fish cakes etc. I also make batches of lunchbox items such as pizza/cheesymite scrolls (my kids aren’t big sandwich fans), muesli bars, ready-to-toast sandwiches/rolls (buttered and a slice of cheese inside ready to go in the sandwich toaster in the morning or the night before, depending on when I am making lunches).